…no it’s not the NHL playoffs. Why would you say that. it’s the World Juniors. Honestly, please get with it. Anywho, the Flyers had some prospects in this tournament, and their national teams found varying degrees of success for themselves, but we’re here to talk about their individual efforts, more or less. There was a lot to like, and they gave us a lot to look forward to. But before we get into the breakdown, we want to make a note that even though these players didn’t come away with medals (we’ll be talking about those who did tomorrow), we still want to acknowledge that they did a big thing in representing their countries on this stage, and we’re still proud of their efforts. We don’t that to get lost in any of the other emotions tied to this tournament. And now onto the notes. So we shouldn’t let the stat line tell the whole story on Ginning’s play in this tournament, rather, we should offer a bit of context to it—having spent the duration of the tournament playing in a third pair role, and knowing what we know about his more stay-at-home style of play, plus Sweden’s overall lack of offensive production, we understand how a player like Ginning might come out of this tournament without any points. Might we have liked to see him try to take a step up and contribute in this way? Sure. But we’re also not too concerned, having seen this not happen. So what’s there to take away from Ginning’s play? it’s tough to give a really comprehensive breakdown, given his limited minutes. It wasn’t a perfectly polished performance—he had a couple of tough turnovers, and, as a player with a bit of edge, stepped over the line once and took a boarding call—but on the whole, he did just fine in his role. And, for a player we’ve had a lot of questions about since he was drafted, this seems a not unsubstantial mark of praise. He came in and proved he could hang with some of the most talented players in his age group. And we can certainly commend him for that. Evidently the theme with Flyers prospects from Sweden playing in this tournament (yes, that’s a pretty niche group) is that of them being something of question marks coming into the tournament. The 2018 fifth round pick found himself somewhat eclipsed in his first development camp by the Carter Hart vs. Felix Sandstrom showdown, and this took our complete attention away from him, but he went back to Sweden and had himself a very good start to the season, putting up a .941 save percentage with Västerås IK in the Allsvenskan, which certainly turned some heads. And then he did a big thing—he came into the World Juniors training camp and preliminary rounds and stole the starters job, and he ran with it. More of a technical goaltender, he stuck with his fundamentals, and that served him well. He didn’t bring a terribly flashy game, on the whole, but what stood out was how complete that game looked. 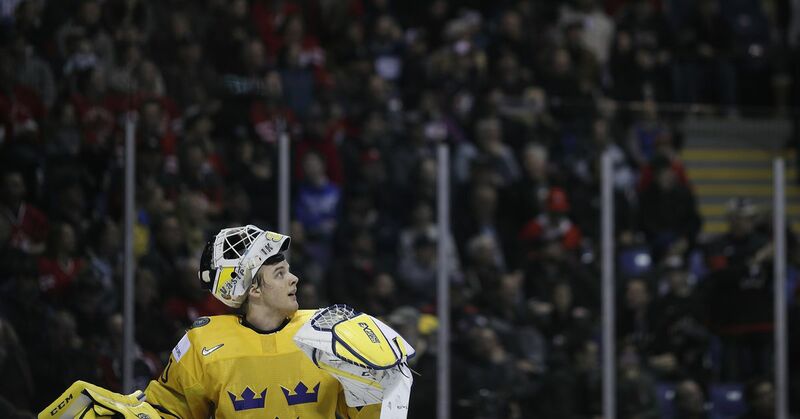 It wasn’t perfect—with a couple of on-the-softer-side goals later in play—but he looked like the starting goalie for a team of Sweden’s most talented youngsters. He didn’t play small, or rattle under the pressure, just kept his head down and kept to his details, as they say. In a way, it feels a shame that he didn’t come out of this with more to show for it—though top goalie and player honors for his play are nothing to tip one’s nose at—considering how strong his play was. But, as we said in the intro, we’re proud of him, all the same. And now it’s Canada time! It’s Morgan Frost time! Canada came into the tournament as one of the favorites and found themselves upset by Finland, and that’s a shame. It’s also a shame that Frost somehow came out of this one without any player of the tournament honors despite, uh, that stat line that you saw a second ago. But, despite all of that, we can feel pretty comfortable saying that Frost was one of the best players on Team Canada. With a hat trick in their preliminary round game against Denmark, he came out with some serious energy and flash, but this wasn’t just a flash in the pan sort of situation—he was extremely solid through each of his five games played. We could get into the nitty gritty of the small details of his game that stood out (vision and quick release, hello), but what we want to touch on is a more general idea—how he was able, particularly in that Denmark game, to completely take over play and look positively dominant. They just didn’t have an answer for him. And maybe this is where we might make a note about level of competition, but the idea still stands. There were plenty of sequences in this tournament where he seemed to take play on his back, if you will, to create chances for his team. And he did all this in a new position—a natural center, he was bumped to wing for this tournament. But, we do also love those less nebulous goals, so let’s have a look at some. He was also the points per game leader of the whole tournament, when everything was said and done, which feels perhaps one of the more exciting pieces we can take away from this. What else is there? Those of us in Philadelphia who have been paying attention to his play and his progress have been excited about his potential for a while now, but it was nice to see him not just showing that on a larger stage, but positively pushing past even our expectations. And it feels there’s still even more to see, yet.